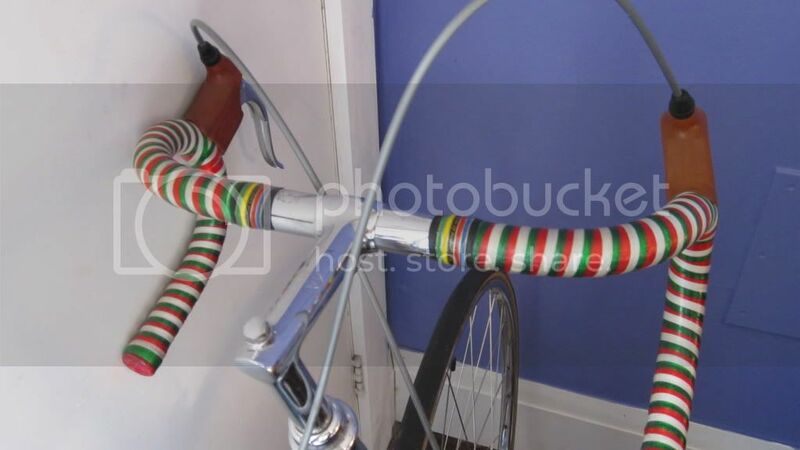 The most awful or most awesome bar tape in the history of everything? You judge. I'll definitely be changing this for flipper blue. Meh. I've seen worse. And luckily for you, basic black will go well on this bike. Tom - panda bears for bob's sake. Panda bears. yeah, I know. But from a distance, it just look like a splash pattern. Come on, you know you've seen worse. My most recent acquisition came with electrical tape (sorry, no pictures). I found out that the glue from electrical tape is very messy, seeps out around the edges in hot weather and gets all over your hands. Pretty awful to go for a ride and come back with black, sticky, glue-covered hands. I once bought this American flag tape being sold by Cinelli that was probably the ugliest tape in the history of mankind. To make it worse it faded very quickly and it ended up looking like the bunting around a used car lot. 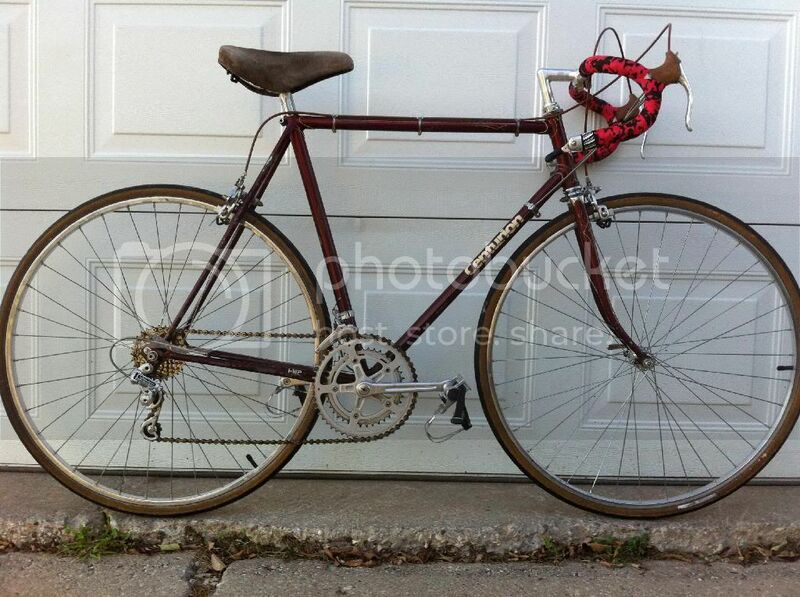 I've always loved Benotto tape, and use it on most of my bikes. The best thing about it is that you can unwrap it and use it again if you feel like changing it, it feels great and doesn't get wrecked in the rain or get dirty. At least when you get close, it's not splash tape. Splash tape is ugly far away, as you approach, and up close. Then again, I don't know Art. Nope. This is the worst bar tape in the history of everything. Why does the World Wrestling Federation have panda bears? His career sort of floundered after Paul Simon didn't it? It was one of the less successful gimmicks they did in the 70s. Andre the giant would first wrestle, and then eat a panda bear in the ring. I also like the bug tape, but I eat off of this plate. Last edited by KonAaron Snake; 06-12-15 at 05:43 PM. I couldn't eat off that plate. In Colorado, there is a market for that dish as an ash tray. A friend bought a couple for us as a birthday gift. I've always liked them. Wow!! They even sell Christmas tape. Those bars look like candy canes. It's not necessarily ugly, it just doesn't befit the particular bike. What about an earthy orange, rust brown, or caramel color? Not my bike, but what a beauty! Well put together colors. Bikes: 81 Ross T.K., 89 Merlin mtn. Everyone knows the Panda is the Best Bear!!! Plus WWF, some monies may have gone to charity at some point. The most awful, is old worn tape with someone else's dirt and sweat. Wrong. 50 not even best Bear LB.